Battletech’s thunderous robots, armed to the teeth with deadly missiles, lasers and cannons, might be its most overt hook, but Harebrained Schemes’ game also places a distinct focus on the pilots inside those ‘Mechs and their various supporting crewmembers. It’s there that the game’s other strength becomes most visible. 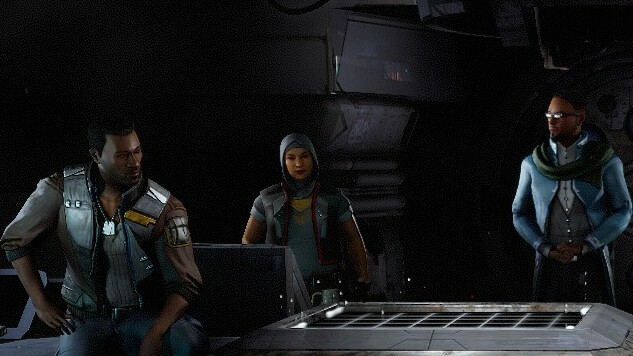 Battletech conveys a sense of effortless incorporation of diverse characters, from those that you can encounter in your squad to your crewmates onboard the spaceship that serves as the game’s staging area. Any discussion of representation in games has to begin with the problem of representation in games. Or, more accurately, the pushback from a certain vocal segment of the gaming population that rears its head whenever a developer deigns to mention something like putting alternative pronoun options in their game (which, I am pleased to note, Battletech does). The lack of character diversity is more often a problem centered here, in regressive fan pushback toward game casts. When Battletech launched on Steam with the aforementioned pronoun picker placed front-and-center in the game’s character creation, the game’s Steam ratings were disappointingly (but unsurprisingly) low at first as swarms of negative reviews focused on this aspect above all. Many of these reviews alleged that developers spent far too long on adding a single pronoun picker to the character creation process, somehow impacting the quality of the game in other ways in the process. Jury’s still out on that one. I certainly liked the game enough. One of the places that Battletech sets itself apart from other games in its lineage and in its strategy space is in the supporting cast onboard your spaceship and among the game’s missions. Most of your team is nonwhite, and significantly non-male. 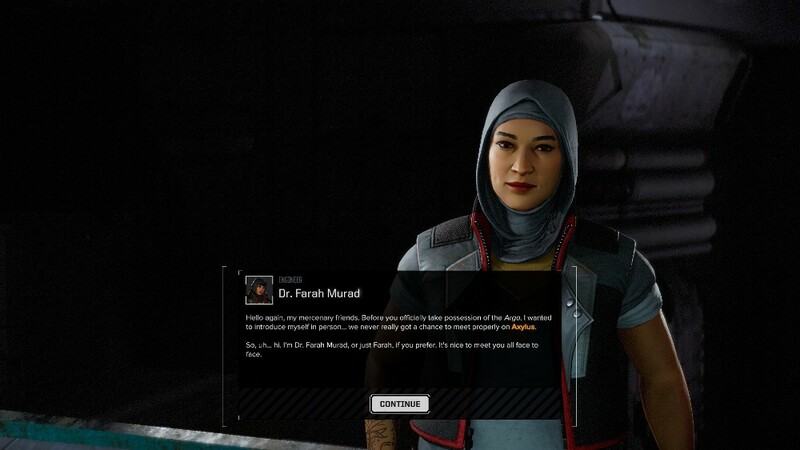 Due to the affordances of Battletech lore, there are members of different faiths as well—your engineer, Dr. Farah Murad, is open about her history as a Muslim, and wears a hijab throughout the game. In comparison to other science fiction games, even those that I particularly enjoyed like theMass Effect series, Battletech stands alone in this way. The game isn’t particularly loud about these characters—they aren’t treated as stereotypes or as stand-ins for their entire races and/or ethnicities. 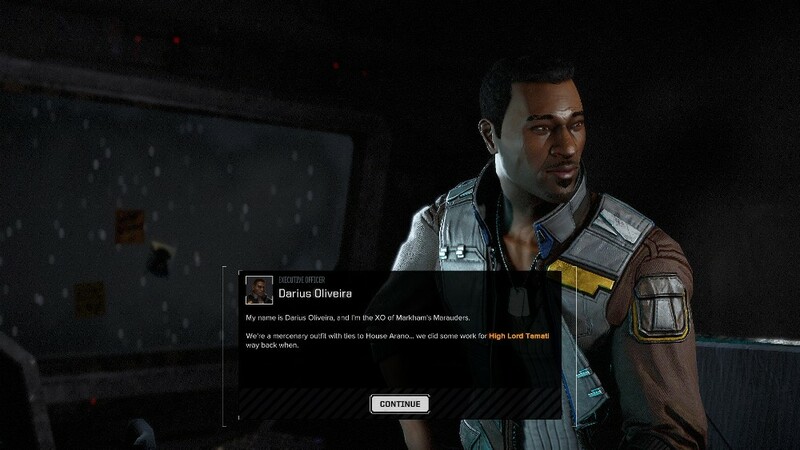 The setting of Battletech allows for these characters to exist first and foremost as actors in the story, and not necessarily representatives of an entire real-world identity. This is where it’s notable: there is no reason for these characters to not be white men, and yet they aren’t. These characters don’t feel chosen to fit a quota, but feel like different and unique representations of roles that in mainstream science fiction are usually given to white characters, and even then mostly white men. And that makes them memorable. It’s a casual sort of diversity. It’s welcoming. It’s the sort of story that reminds you that the world isn’t just white men with guns, but that even in the stars there will be brown skin. If you are accustomed to seeing yourself in games, representation probably isn’t that big of a deal. This is where a lot of the more regressive attitudes toward games diversity tend to come from—the assumption that everything is okay because there is no perceived problem by those who already occupy the majority of game representation. No one is hurting for another gruff white man to head up a videogame, but protagonist examples to the contrary show up in only a handful of best-selling games in the past decade. The cumulative effect of this lack of representation, especially in media that you care about or consume regularly, can become as painful as being exposed to overtly racist acts. This January, a study by a University of Saskatchewan researcher, Cale Passmore, found that results indicated what game diversity advocates had long argued: the continuous effect of not seeing characters that non-white players could identify with over time produced the same effects as everyday racism. If you’re someone who rarely sees people who look like you, there is something powerful in playing as or alongside characters that remind you of your history, instead of being asked to constantly empathize with characters who have nothing in common with you. It’s something intimately familiar to any game player who doesn’t fit the mold of the most common protagonist stereotypes, and it’s one that more diverse casts in games can work against. The media that we consume will always affect us on some level. Games have a long way to go before they can reach anything on the level of parity in terms of representation, but it’s games like Battletech, willing to provide a diverse and engaging cast of characters without reducing them to stereotypes or using them as mouthpieces for entire cultures, that stand out as a step forward. Space is really big, it’s full of robots, and it’s full of people—different people, with different histories, from different walks of life, who bring different things to the table. Battletech knows this, and isn’t afraid to show it.